The influencer marketing industry is booming, and marketers are doubling down on sponsored content by the billions. A whopping 80% of marketers find influencer marketing effective, and nearly 2/3 are increasing their influencer marketing budgets this year. As more marketers dive headfirst into influencer marketing, it helps to study successful influencer marketing campaigns as a blueprint. 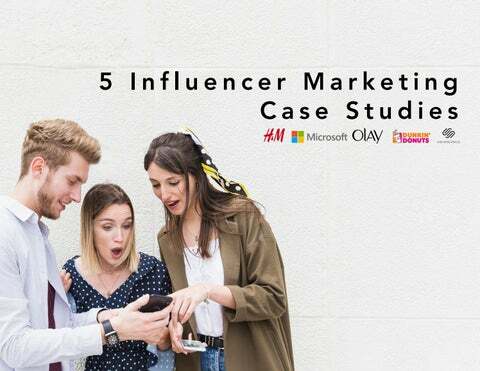 These case studies were handpicked for their unique creative approach, strong performance, and valuable insights on building unique influencer campaigns. Note: These analyses are solely based on our observations and interpretations of these influencer marketing campaigns. How H&M Reached 12M Consumers Through Four Sponsored Videos APPROACH H&M partnered with four celebrities. Each of the celebrities posted a 10-second “teaser” clip—as well as a full 1-minute ad—across Twitter, Facebook, and Instagram. There were a total of 6 posts per influencer and 24 posts for the campaign. Each post included #hm as well as a link to the H&M website. GOALS Build brand awareness and desirability around the H&M brand during the holiday season. Drive clothing sales, specifically for the holiday line. Align content with each celebrity’s personality and lifestyle in order to create authentic content and messaging for H&M. American actress and model known for her performances on Disney Channel and in the Diary of a Wimpy Kid film series. British-Canadian television hostess, actress, and former fashion model known for her performance on the TV series New Girl. American actor known for his starring role on the MTV series Teen Wolf. American actress and country music singer known for her performance on the TV series One Tree Hill. Teaser clips were pulled directly from the full ad and posted a couple of days before the full video was released. This strategy helped generate buzz and excitement for the campaign. Additionally, by presenting the content two different times, H&M was able to appeal to more viewers and increase the visibility of their campaign. Peyton List and Jana Kramer actually got more views and engagement on the short clip than the full video, indicating that in some cases the perfect short clip can be even more effective than longer-form content. In this humorous sponsored video, Tyler Posey rocks out too hard while getting dressed, causing a fashion emergency that sends him running to H&M. In Peyton Listâ&#x20AC;&#x2122;s video, she models several bedazzled H&M outfits in front of her mirror before finally selecting her perfect last-minute holiday party outfit. In this sponsored video, Jana Kramer and her adorable baby girl pose for their Christmas card in new H&M outfits. When Hannah Simoneâ&#x20AC;&#x2122;s cat ruins her outfit in a kitchen accident, Hannah rushes to H&M and comes back looking more stylish than ever. Why H&M Succeeded 1. CHOSE THE RIGHT INFLUENCERS. H&M chose its celebrity influencers wisely. Rather than spending the entire campaign budget on the largest celebrity influencer it could afford, H&M went with several lesser known celebrities with highly engaged and devoted social media followings. When it comes to influencer marketing, bigger is not always better, and H&M’s awareness of this paid off. 2. ALLOWED INFLUENCERS TO CREATE CONTENT THEIR AUDIENCE WILL LOVE. The sponsored videos were customized to align with each celebrity’s existing social media content. For example, Hannah Simone’s sponsored video was centered around her cat, Alphie, who is frequently featured on her social media pages. By creating content that was true to each celebrity’s interests and personality, H&M was able to maximize engagement. To this point, the top comment on Tyler Posey’s Facebook post was, “Weird thing is this isn’t Tyler acting for an advertisement it’s actually just him being himself.” This comment received 1,562 likes, and is a testament to the authenticity of H&M’s campaign. 3. LEVERAGED EACH INFLUENCER’S SOCIAL PRESENCE TO REACH CROSS-CHANNEL AUDIENCES. Lastly, by exploiting all social media platforms available, H&M was able to fully maximize the reach of its campaign. For International Women’s Day, Microsoft leveraged National Geographic’s widereaching social media presence as well as some of the most renowned adventure photographers to build an Instagram marketing campaign. In this case study, we’ll take a closer look at Microsoft’s partnership with National Geographic and why it succeeded. How Microsoft And National Geographic Got 3.5M Likes On International Women’s Day APPROACH Microsoft’s International Women’s Day Instagram marketing campaign was part of their “Make What’s Next” campaign. The campaign, which Microsoft launched in 2016 for International Women’s Day and picked back up in 2017, aims to encourage young girls to work in STEM (Science, Technology, Engineering, Math). Other components of the campaign include a 60-second TV ad, a career explorer tool created in partnership with LinkedIn, and a workshop that was available in stores and on Facebook Live on March 2017. Build brand awareness and foster positive public perception. Create genuine messaging that encourages girls to pursue jobs in STEM. Capitalize on a trending worldwide event, International Women’s Day. For the Instagram component of the campaign: A total of 30 photos were posted on five of National Geographicâ&#x20AC;&#x2122;s Instagram channels: @natgeo, @natgeotravel, @natgeaoadventue, @natgeoyourshot, and @natgeochannel. The photos were taken by several popular adventure photographers, most of which are affiliated with National Geographic. Each photo caption featured the story of a prominent female scientist or adventurer. Each photo caption also included: @Microsoft - Empowering girls to change the world, stay in STEM, and be the ones to #MakeWhatsNext. Microsoft welcomes girls for a free workshop with @natgeo personalities at select Microsoft stores on 3/18/2017. In this post, Mittermeier’s passion for her work as a marine biologist shines through. Coupled with a stunning visual, this creates a compelling image that helped deliver Microsoft’s message to millions in an elegant way that lent itself to sharing (tags) and organic engagement (likes, comments, and social sentiment). This post, which highlights the role Juan served in helping save the giant panda from extinction, is an excellent example of why women in STEM matter. By highlighting a central idea as a part of an important theme, Microsoft’s message became a part of a larger message likely to resonate with many. This post appeared on the adventure focused National Geographic sub-account and shows how STEM is vital to activities like rock climbing, which rely on math and engineering to make the sport safe and possible. By finding a real-world application of vital STEM principles, this post helps align relevant, real-world applications with Microsoftâ&#x20AC;&#x2122;s campaign message. By focusing on community and the impact of women working together in science, this image of a young female scientist serves to inspire other girls to follow their passion in STEM. The human element in this post helped bring a strong, resounding idea to Microsoftâ&#x20AC;&#x2122;s messaging that extends beyond the brand itself. Why Microsoft Succeeded 1. LEVERAGED NATIONAL GEOGRAPHIC’S ESTABLISHED SOCIAL MEDIA REACH. National Geographic has an extraordinarily strong social media presence. It was recently named the #1 brand on social media by Shareablee based on a combination of followers and engagement data. By partnering with a well established and credible brand publisher on social, Microsoft was able to reach an enormous audience of 91 million. 2. ALIGNED CAMPAIGN MESSAGING AND DATE WITH AN INTERNATIONAL HOLIDAY. By planning its campaign in conjunction with International Women’s Day, Microsoft was able to contribute relevant content to the IWD conversation and maximize its campaign’s impact. 3. SHOWCASED AUTHENTIC STORIES AND POWERFUL IMAGERY THROUGH SPONSORED POSTS ON INSTAGRAM. Microsoft crafted its sponsored posts around stories of real human experiences. The faces of this campaign were real faces with real stories, and that was a powerful core element. This strategy helped Microsoft connect and engage with audiences on a deeper level and build long-term brand awareness and approval. The beauty influencer industry is a crowded space, meaning it can be tricky for brands to break through and achieve ROI. In order to stand out in the crowd, established beauty brands like Olay can leverage Instagram influencer marketing coupled with good old-fashioned cause marketing to share a unique message. 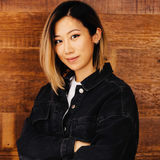 How Olay Achieved An Instagram Engagement Rate Higher Than 8% APPROACH In mid-August 2018, Olay announced a campaign centered on a handful of female influencers to encourage women to be “unapologetically” themselves and to disregard all comments that they were “too much” of any particular quality. They partenered with nine diverse women (referred to as the “Fearless 9”) as the faces of the campaign. Olay built a dedicated micro-site that hosted behind the scenes footage of the photoshoot with Vogue, who published the campaign in its September issue. GOALS Connect to a diverse audience (primarily female) to generate relatability through female icons. Increase brand awareness to encourage women to embrace their real beauty and defy societal expectations. Establish brand affinity and subsequent product sales through Olay’s dedication to empowering women. The “Fearless 9” includes an impressive lineup of models and athletes, such as Aly Raisman and Denise Bidot, as well as other female powerhouses, like Jillian Mercado and Piera Gelardi. Using the #FaceAnything hashtag as their signature, Olay aimed to spark a movement for all women to embrace natural beauty. The 28-day challenge encouraged each influerncer to break free from their normal beauty routines in exchange for Olay skincare products and a makeup-free event at the challenge’s termination. Alongside the nine women featured in the Vogue spread, Olay reached out to an assortment of lifestyle, beauty, and skincare influencers to partake in a 28-day challenge in which each received custom packages of Olay’s products to be used in preparation of a major makeupless moment. Denise Bidot shared a few different sponsored #FaceAnything posts, with one featuring a long-form caption that details her new skincare regimen with a few Olay products. Denise shared the positive results of the new regime, and a photo of her glowing skin without makeup. Lilly Singh shared a couple of posts in support of the campaign, celebrating the exciting news of being part of the New York Fashion Week runway cast walking without makeup. She also expresses gratitude for being included on the billboard in Times Square promoting the cause of self-love and natural beauty. Mama Cax, an outspoken cancer survivor, shared several posts throughout the campaign, including this one which captures a special moment in which she poses in front of her newly erected Times Square billboard. Nabela Noor took to Instagram with multiple posts that document her new Olay routine and add color to her past with skincare problems. In this initial post, Nabela kicks off the challenge and invites her audience to live fearlessly as well. Perhaps better known for her ballerina and gaming skills, Mari Takahashi, shared how much of a difference the Olay skincare products made. She describes the liberating feeling of walking the runway without makeup and embraces what Olay stands for by painting beauty in all her flaws. Christen Dominique highlights her glow in a series of posts that capture her enthusiasm for the campaign challenge. She features photos with her renewed skin and includes engaging captions to build suspense and keep her audienceâ&#x20AC;&#x2122;s attention. Why Olay Succeeded 1. CHOSE A CORE GROUP OF “FEARLESS 9” INFLUENCERS. Olay carefully selected a diverse range of influencers for the Fearless 9, women who were excited about the idea of being vulnerable, telling personal stories, and committing to posing makeup-free for photos. 2. SUPPORTED INFLUENCERS IN SHARING PERSONAL STORIES AND AUTHENTIC CONTENT. Olay set the rules of the 28-day challenge, coined the #FaceAnything hashtag, and sent products to influencers, but aside from that let the influencers tell their own story about how the products worked for them. The storytelling was highly personal, as the Fearless 9 explored different ways women feel the need to hide their face, their feelings, or themselves. Some talked about times they’ve been told they’re too much of a particular quality such as “too strong,” or “too emotional,” while others explored their personal skincare problems and pushed back on traditional standards of beauty. Dunkin’ Donuts Marketing Strategy Rallies Espresso Lovers With “Sipping Is Believing” Campaign APPROACH Dunkin’s increasing popularity as a provider of drinks to consumers is what underlies this campaign. Coffee is front-and-center while their signature donuts receive little mention. Dunkin’s marketing strategy was defined by a concerted effort to reach an authentic audience and produce high engagement by utilizing nanoand micro-influencers located primarily in Philadelphia. Posts mainly focused on being realistic and relatable to the audience, promoting Dunkin’s new handcrafted espresso drinks. Dunkin’s influencer marketing campaign featured a variety of influencers with 50,000 followers and below, centered around the city of Philadelphia. Influencers produced natural-looking posts to appeal to their smaller, more personal followings. Vanessa Lace primarily posts fashion and lifestyle updates to her 3,000 followers and uploaded a single sponsored post for Dunkin’, featuring her drinking an espresso in her hometown, Philadelphia. Vanessa’s appeal to the typically coveted Millennial audience on Instagram is key for Dunkin’s attempts to challenge more established coffee brands. She used the campaign tags #sippingisbelieving and #phillyrunsondunkin. Reannoin Jean Celins uploads fashion and lifestyle photos for her following. Her online presence bears a striking resemblance to Vanessa’s: both are based in Philadelphia, have just over 3,000 followers, and appeal to a younger female audience. Celins posted a single lighthearted post with some clear personal input in the description while remaining consistent with the brand message and tags. Why Dunkinâ&#x20AC;&#x2122; Donuts Succeeded 1. TAPPED INTO AUTHENTIC FOLLOWERS WITH SMALL NANO-INFLUENCERS. Dunkin donuts partnered with nano-influencers in the Philadelphia area to start a more personal, grassroots movement around their coffee. While the reach was obviously smaller, the engagement on these posts was signifantly higher, and the follower responses were more intimate. 2. KEPT THE CAMPAIGN FOCUS TIGHT. Too many influencer marketing campaigns fall prey to having too many goals and elements packed into a single campaign. They might include a nationwide contest, plus several campaign hashtags, plus a discount code for a product, plus a big event activation, etc. This campaign was highly localized, had two simple hashtags (#phillyrunsondunkin and #sippingisbelieving) and focused closely on increasing awaress and engagment around Dunkinâ&#x20AC;&#x2122;s new espresso drinks. 3. LEVERAGED LOCAL PHILLY PRIDE. Each of the posts played off local pride in different ways. In some cases influencers took photos in iconic places all around the city, like the Lincoln Park Nature Boardwalk, while other posts like this celebrated the Philadelphia Eagles. This coupled with working with nano-influencers made the content highly targeted and tailored to the young, coffee-drinking Philadelphia audience. There are a lot of website-building tools out there, but Squarespace has emerged as a titan of the industry. Hereâ&#x20AC;&#x2122;s how Squarespace collaborated with top science, gaming, and pop culture YouTube channels to drive both awareness and conversions for their service. Popular YouTube gaming channel, The Game Theorists, presents two sponsored videos with Squarespace. Each video, both with over 5+ million views, feature well-animated Squarespace illustrations showcasing specific features and services all presented in Game Theoristâ&#x20AC;&#x2122;s signature style. In addition to a sponsored video, top YouTuber channel Good Mythical Morning (GMM) with over 8.5+ million subscribers links to a dedicated Squarespace landing page www.theinternetisaweirdplace.com. Starting at 14:05, MatPat (the YouTuber behind the channel) candidly explains to his audience how sponsorships work followed by relevant screen share examples of what he is able to do with Squarespace. The landing page features a dedicated video sponsorship and leverages their high-reach video views and audience to drive traffic to Squarespace. In addition to both an introductory sponsor callout and channel promo offer, top YouTuber channel Ray William Johnson (with close to 11 million subscribers) presents a detailed outro demonstration beginning at 6:24. For popular learning channel CrashCourse, Squarespace sponsored a series of astronomy courses presented by Phil Plait (one of the instructors on PBS’s YouTube channel, CourseCourse). Similar to The Game Theorists’ sponsored approach, Ray presents an inside look at Squarespace’s unique features that’s well-integrated with his usual conversational, humorous style. By sponsoring this series, Squarespace ensures that their brand will continually be seen by millions of viewers searching for educational videos. Because CrashCourse’s content is evergreen, Squarespace will continue to capture viewers perpetually, long after the videos’ initial post dates. Why Squarespace Succeeded 1. CREATIVE PARTNERSHIPS WITH SUCESSFUL YOUTUBERS. Squarespace collaborated with many top YouTubers as well as popular YouTube channels in science, gaming, and pop culture. Campaigns were creatively driven by the influencers themselves, and delivered in a tone and style the YouTuber’s fans would respond to. 2. CLEAR TRACKING LINKS AND DISCOUNT CODES. The sponsored videos were designed to drive both awareness and conversions for their online service, and each had a very clear call-to-action and link that users could click on in the description. This enabled Squarespace to easily track sign-ups by influencer, and gain valuable insights for sponsorships in the future. 3. EVERGREEN APPROACH TO EDUCATIONAL VIDEOS. Squarespace sponsored educational video content, such as the science video series on PBS’ Digital Studios “Crash Course” educational channel. Unlike one-off pop culture videos that could lose their relevance in a couple years, the educational videos were strategically designed to drive awareness for many years to come as users continued seeking out these videos for educational purposes. Ready to Get Started? Since 2011, Mediakix has been a trusted partner to clients like Uber, Facebook, Blue Apron, Nordstrom, Hallmark, NextGames, LG, and Sony Pictures. We drive high-impact results powered by years of experience and strong influencer relationships. Find out how we can create a custom campaign to reach your goals.